"Reverse sneezing" is technically called Paroxysmal respiration and occurs in dogs. During a reverse sneeze, the dog is pulling air into the nose instead of out through the nose like in a normal sneeze. This makes an odd snorting sound that can last for several seconds to a few minutes. Reverse sneezing is not a harmful condition although it may appear alarming. The typical case of reverse sneezing appears quickly with no beforehand warning. The dog may take several long breaths while standing with the head extended and making snorting noises. 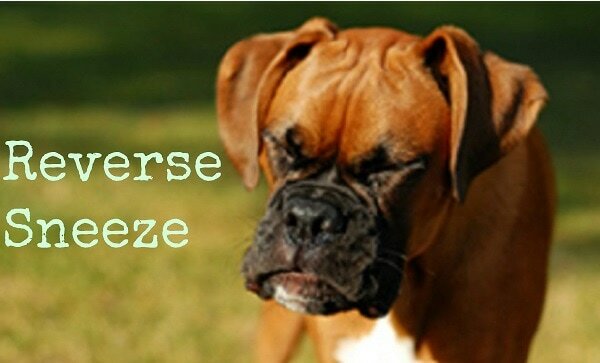 Reverse sneezing is most common in overweight pets, small breeds or brachycephalic breeds, but can occur in any dog. Reverse sneezing may be instigated by environmental allergies or airborne pollutants (such as smoke or aerosol products), excitement, or throat irritation (such as tugging on a leash). If you are concerned, please talk to your veterinarian, as there can be other conditions that create an abnormal breathing pattern (respiratory infection, collapsing trachea, nasal masses or foreign bodies are a few examples). -check the color of your pet's gums and tongue. These structures should be a healthy pink. If the gums or tongue appear grayish or purple, then this is not a reverse sneeze and your pet is having difficulty getting enough oxygen. You need to seek emergency medical assistance. Be aware that some pets have naturally black pigment on their gums or tongue, so it is a good idea to check your pet's mouth when they are not sneezing to know what "normal" looks like. -usually, reverse sneezing does not require any medical treatment, but you can encourage your pet to be calm which helps the episode to stop. Sometimes getting the pet to swallow can help stop an episode, so you can offer your dog a treat or a bowl of water. You may also try blowing in the end of the nostrils, if your pet safely allows this.